Whiskey and the Surfer is the morning radio show you always wished they’d play on the radio. 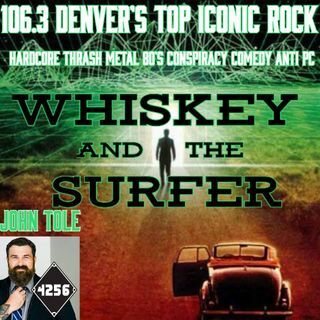 Equal parts rocking good time and laid back hilarity, hosts Whiskey and The Surfer (Wes Key and Fliip Riivers) jam tunes and riff on the topics of today, like alternative realities, simulation theory, Faith, conspiracy, demons, Fake News and movies they will never see. Wes Key (Whiskey) is the cool headed, socially liberal, married, sober, loveable, optimist who loves rock and ... See More Fliip (The Surfer) is the immature, brash, Libertarian, tin foil hat wearing, party aficionado and knower of all things metal. A headliner at the world famous Comedy Works, Tole’s stand up has rocked prestigious stages and festivals, including High Plains Comedy Festival, Oddball Comedy and Oddity Festival, SXSW Interactive, Fun Fun Fun Fest, Limestone Comedy Festival, and multiple Moontower Comedy Festival appearances. John has been featured on Sirius XM, VICE, Hits 1, Howard 100 and Howard 101, and was a contributor to The Howard Stern Show. In addition, John is a regular on Deathsquad Chronicles, Steve Simeone's Good Times and Sam Tripoli's Tin Foil Hat Podcast on All Things Comedy.